And I must admit, this was a sillier movie than Psycho. 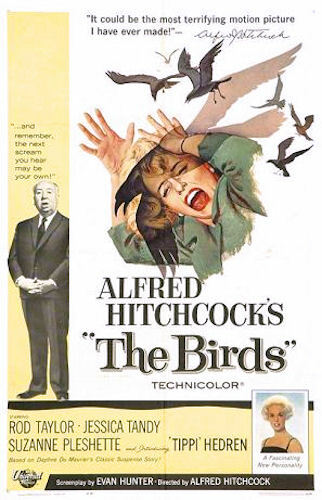 For one thing, The Birds necessitated special effects, and 1963 special effects do not play well in 2015. The attacking birds were a low point in the action, for their unrealism. (I suspect the sound effects of rioting birds were provided by screeching cats.) For that matter, the threat the birds posed read well on the page, but did not ring true onscreen: much flailing, of people and of birds, but not much evidence of real danger. As in Psycho, drivers persisted in getting into their cars via the passenger door. Also, they walk into one another’s homes – even strangers’ homes – right through the (unlocked) front door, sometimes without knocking. This I find most strange (and it happened in Psycho, too). Was this a 1960’s reality?? The early storyline begins in the bird shop and involves two people engaged in a bit of a feud; this quickly and strangely progresses into gift-giving and making out, which progression was not entirely transparent to me. I was interested in the friendship developing between Melanie and Annie, though. More so than in Psycho, I found a few of these characters to be fairly interesting people, and I liked that most of the key characters were women, Mitch being defined by relationships with mother, sister, ex-girlfriend and new girlfriend. But then our female lead, who had been a fairly strong woman, became a big heap of limp weakness, which was thoroughly disappointing. (Although perhaps unsurprising, considering 1963.) There was one visual, of a moonlit car on beach with birds, that I found striking. Other than that, this one gets a general ‘meh,’ and does not satisfy in the way that Psycho did. I’m happy to believe it did better than this in its own time, but it translates poorly to the modern one. For me, not Hitchcock’s best. A silly movie indeed. I’ve never cared for it. It did inspire a cool sequence in Resident Evil Extinction, but that was about ten minutes long, which is about how long birds can be scary. Oh, and people walking into each other’s houses, in the 1960s? Not in cities, certainly, but I’ve experienced it. Particularly with family who live on the same block. Glad to have the confirmation. I still run across people who say they were terrified by this movie, and fear birds to this day. I don’t quite understand.